Eagle is the common name for various diurnal birds of prey in the family Accipitridae of the bird order Falconiformes, characterized by large size, powerful hooked beaks, strong legs and feet with great curved, sharp talons, keen vision, long broad wings and strong soaring flight, and fully feathered, often crested heads. In particular, members of the genus Aquila are known as "true eagles," but many other birds in other genera also are known as eagles. Eagles are not a natural group but denote essentially any bird of prey large enough to hunt sizable (about 50 centimeters long or more overall) vertebrate prey. Birds with the common name of hawks and kites are also members of the Accipitridae family. Eagles are important in food chains as top predators, with larger species, such as the harpy eagle (Harpia haryja) and crowned eagle (Stephanoaetus coronatus), even preying on adult monkeys, sloths, porcupines, small antelope, and large parrots (Olsen 2004). The Australian wedge-tailed eagle (Aquila audax) has been known to hunt cooperatively and kill adult kangaroos and dingoes (Olsen 2004). For humans, they have an integral role in culture as national and organization symbols, and the eagle is a sacred bird in some cultures, with the feathers central to many religious and spiritual customs. They appear prominently in myth and literature. On a practical level, eagles sometimes are used in falconry. The Accipitridae family, to which eagles belong, is one of the two major families within the order Falconiformes (the diurnal birds of prey). In addition to eagles, many well-known birds, such as hawks, kites, harriers, and Old World vultures are included in this group. Most other raptors, but not all, belong to the Falconidae, or falcon family. Accripitrids differ from members of the other raptorial family in several skeletal features, as well as having well-developed nest-building behavior (versus poor or absent), forceful squirting of excreta (versus dropping of excreta), and yellow, red, or hazel eyes (versus brown) (Olsen 2004). The powerful harpy eagle can easily grab a monkey weighing 5 kilograms and fly away with it. The accipitrids have been variously divided into some 2 to 10 subfamilies. Most of them share a very similar morphology, but many of these groups contain taxa that are more aberrant. These are placed in their respective position more for lack of better evidence than anything else. It is, thus, not very surprising that the phylogenetic layout of the accipitrids has always been a matter of dispute. The Accipitridae are a diverse family with a great deal of variation in size and shape. They range in size from the tiny pearl kite, which is 25 centimeters in length and weighs no more than 100 grams, to the Philippine eagle, which is 1 meter in length and which may weight up to 7 kilograms (Thiollay 1994). The beaks of accipitrids are strong and hooked (sometimes very hooked, as in the hook-billed kite or snail kite). In all accipitrids, the base of the upper mandible is covered by a fleshy membrane called the cere, which is usually yellow in color. The tarsi of different species vary by diet, those of bird hunting species like sparrowhawks are long and thin, while species that hunt large mammals have much thicker, stronger ones, and snake-eagle have thick scales to protect from bites. Eagles are differentiated from other birds of prey mainly by their larger size, more powerful build, and heavier head and bill. Even the smallest eagles, like the booted eagle (which is comparable in size to a common buzzard or red-tailed hawk), have relatively longer and more evenly broad wings, and more direct, faster flight. Most eagles are larger than any other raptors apart from the vultures. 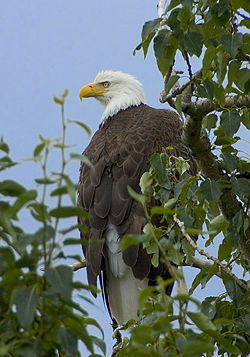 Eagles (and hawks) also have the bony eye shield ("brow") that is lacking in the kites of the same family (Olsen 2004). Eagles belong to several genera that are not necessarily closely related to each other genetically. In recent years, new research into eagle taxonomy suggests that the important genera Aquila and Hieraaetus are not composed of nearest relatives, and it is likely that a reclassification of these genera will soon take place, with some species being moved to Lophaetus or Ictinaetus (Lerner and Mindell 2005). Most of the more than 60 species of eagles occur in Eurasia and Africa (del Hoyo et al. 1994). Outside this area, just two species (the bald and golden eagles) can be found in the United States and Canada, a few more in Central and South America, and three in Australia. Like all birds of prey, eagles have very large powerful hooked beaks for tearing flesh from their prey, strong legs, and powerful talons. They also have extremely keen eyesight to enable them to spot potential prey from a very long distance (Shlaer 1972). This keen eyesight is primarily contributed by their extremely large pupils, which cause minimal diffraction (scattering) of the incoming light. In Britain before 1678, the term eagle referred specifically to the golden eagle, with the other native species, the white-tailed eagle, being known as the Erne. The modern name "golden eagle" for Aquila chrysaetos was introduced by the naturalist John Ray. 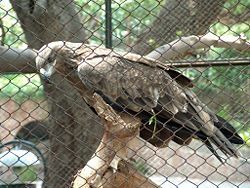 A Steppe Eagle in Lahore Zoo Pakistan. A dark individual of the short-toed eagle. The eagle is a sacred bird in some cultures and the feathers of the eagle are central to many religious and spiritual customs, especially among Native Americans in the United States and First Nations in Canada, as well as among many of the peoples of Meso-America. Some Native American peoples revere eagles as sacred religious objects and the feathers and parts of bald and golden eagles are often compared to the Bible and crucifix. Eagle feathers are often used in various ceremonies and are used to honor noteworthy achievements and qualities such as exceptional leadership and bravery. In the cultures of the Northwest Coast, Eagle is also a supernatural being and also the ancestor and features in the heraldic crests of important clans known as totem poles. The Moche people of ancient Peru worshiped the animal and often depicted eagles in their art (Berrin and Larco 1997). Despite modern and historic Native American practices of giving eagle feathers to non-indigenous people and also members of other tribes who have been deemed worthy, current United States eagle feather law stipulates that only individuals of certifiable Native American ancestry enrolled in a federally recognized tribe are legally authorized to obtain eagle feathers for religious or spiritual purposes (USFWS). In Canada, poaching of eagle feathers for the booming U.S. market has sometimes resulted in the arrests of First Nations person for the crime (Sin 2006). The eagle is the symbol used to depict John the Apostle in some Christian churches, whose writing most clearly witnesses the divinity of Christ. In art, John, as the author of the Gospel, is sometimes depicted with an eagle. The eagle is very commonly used as a symbol for nations and organizations. Berrin, K. and Larco Museum. 1997. The Spirit of Ancient Peru: Treasures from the Museo Arqueológico Rafael Larco Herrera. New York: Thames and Hudson. ISBN 0500018022. Bunce, M., M. Szulkin, H. R. L. Lerner, et al. 2005. Ancient DNA provides new insights into the evolutionary history of New Zealand's extinct giant eagle. PLoS Biol 3(1): e9. Retrieved September 29, 2008.
del Hoyo, J., A. Elliot, and J. Sargatal (eds.). 1994. Handbook of the Birds of the World, Volume 2: New World Vultures to Guineafowl. Lynx Edicions. ISBN 8487334156. Lerner, H. R. L., and D. P. Mindell. 2005. Phylogeny of eagles, Old World vultures, and other Accipitridae based on nuclear and mitochondrial DNA. Molecular Phylogenetics and Evolution 37: 327–346. Retrieved September 29, 2009. Olsen, P. 2004. Accipitridae. In B. Grzimek, D. G. Kleiman, V. Geist, and M. C. McDade, Grzimek's Animal Life Encyclopedia. Detroit: Thomson-Gale. ISBN 0307394913. Shlaer, R. 1972. An eagle's eye: Quality of the retinal image. Science 176(4037): 920–922. PMID 5033635. Retrieved September 29, 2008. Sin, L. 2006. Charges laid in eagle-poaching case: Bird parts used in native ceremonies or for artistic purposes. The Province April 30, 2006. Retrieved September 29, 2008. Thiollay, J. M. 1994. Family Accipitridae (Hawks and Eagles). In J. del Hoyo, A. Elliot, and J. Sargatal (eds.). Handbook of the Birds of the World, Volume 2: New World Vultures to Guineafowl. Lynx Edicions. ISBN 8487334156. United States Fish and Wildlife Service (USFWS). n.d. National eagle repository. Office of Law Enforcement, United States Fish and Wildlife Service. Retrieved September 29, 2008. This page was last modified on 17 October 2008, at 14:53.